I’d like to take a moment to introduce you to agruably the best holiday dessert imaginable. Scrap the pumpkin pie, ditch the spiced pears, drop that caramel apple and back away from that nutty candy bar. This Pumpkin and Pear Cheesecake Trifle with Salted Caramel and Nut Crumble is all you’ll need this holiday season! Friends, family, coworkers, and that weird neighbor of yours will all marvel at the delicate complexities of this fine dessert. Layers of flavor (no, not gum) and perfectly balanced textures all come together to create a bittersweet symphony. Make Salted Caramel: Combine sugar, water, cream of tartar, cinnamon and star anise into a saucepan. DO NOT STIR. Bring to a boil and cook until the caramel browns. When the caramel is dark amber brown, remove from heat and carefully add cream and salt. Simmer for 5 minutes. Pour into a bowl and with tongs remove cinnamon stick and star anise. Chill in refrigerator or set bowl over an ice bath to chill. Stir frequently to expedite chilling. Sauté Pears: Using a vegetable peeler, peel and dice the pears into medium size dice. Heat butter in a sauté pan set over medium high heat. When the butter is melted and starting to foam up and turn brown, add the pears. Sauté for a couple minutes or until soft but not mushy. Stir in the salted caramel sauce and remove from heat. Set aside until ready to assemble trifle. Make Pumpkin Cheesecake Filling: Place the cream cheese and brown sugar into a medium bowl or into the bowl of a stand mixer. Beat with mixer until smooth and airy, about 3-4 minutes. Add the pumpkin and continue to `beat until smooth. Chill mixture or place over an ice bath until ready to assemble or at least 15 minutes. Make Nut Crumble: Pulse almonds, sugars, and salt in a food processor until coarsely chopped. With the food processor running, add melted butter and pulse until incorporated. The mixture should resemble rocky wet sand. ASSEMBLY FOR MINI TRIFLES: Lay out the mini cups. Pour 1 tablespoon of the caramel sauce into each cup. Next, pipe or spoon about 3 tablespoons of the pumpkin filling onto the caramel. 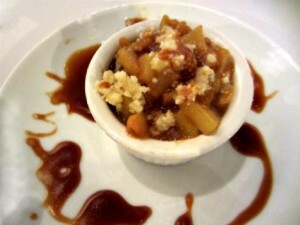 Follow with a heaping tablespoon of the sautéed pears then top with a tablespoon of the nut crumble. Serve immediately on a platter with mini spoons. ASSEMBLY FOR ENTRÉE SIZE TRIFLES: Follow the technique for the mini trifles above but repeat the pattern to have 2 layers of all the ingredients. Place glasses onto a napkin lined plate and serve immediately.